I was going to wait and incorporate this into a post I’m writing but people won’t stop sending it to me so I might as well put it up now. Yes. You read the title right. Walmart is selling a Fixed-Speed bike made by Mongoose. Fixed-Speed? Whatever the hell that means. In the words of Shang Tsung “It has begun“. 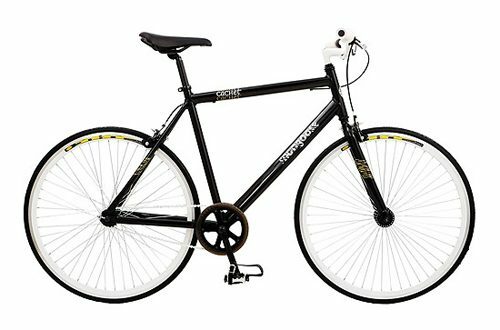 The new 700C Mongoose Cachet Bike offers the ultimate experience in simplicity and style. Single-speed gearing makes for easy and intuitive riding. Caliper brakes and high-profile colored rims add urban style.